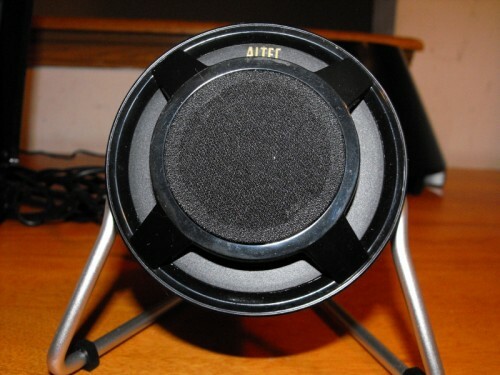 I was looking for a new speaker system to use in my kitchen with my laptop or mp3 player, when I came across the expressionist PLUS system from Altec Lansing. The Altec Lansing expressionist PLUS is a attractive speaker system that not only looks good, but sounds good as well. Equipped with a sub woofer and two satellites, the expressionist PLUS system is capable of providing some thumping bass as well as decent midrange audio. I was impressed with the abilities of such a small and compact system. This system is much smaller than the one my wife currently uses on her computer. I tested it with some AC/DC while prepping dinner the other night, and I was pleased with the kicking audio these produced. It didn’t even distort when Angus was belting out the lyrics from Rock and Roll Train on their Black Ice album. 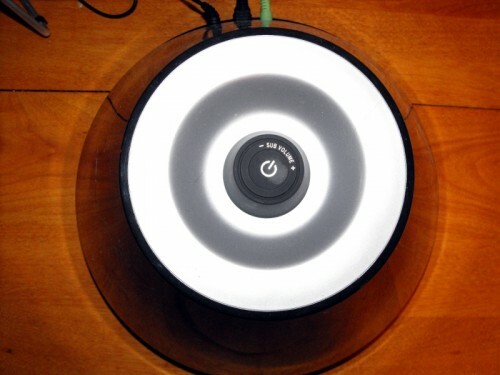 The Subwoofer is the heart of the system with the main power button on the top of the conical subwoofer. 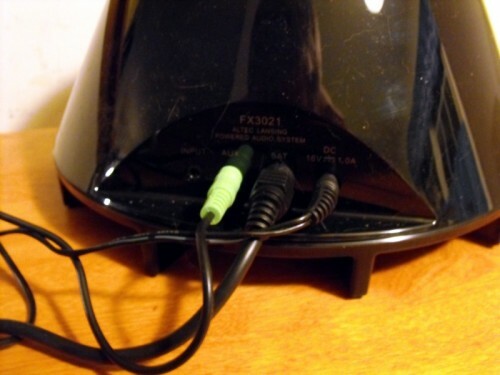 Around the edge of the power button is a dial for adjusting the subwoofers volume. I initially thought this was for the entire system until I saw the buttons on the right satellite which I will get to in a moment. 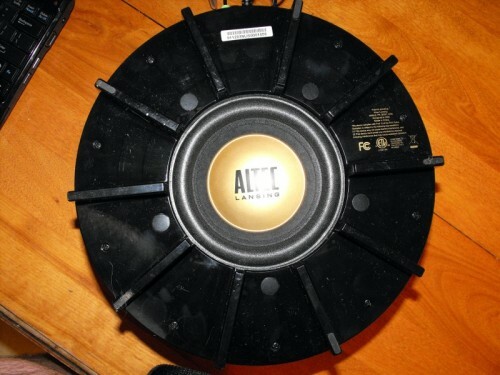 On the bottom of the subwoofer is the most delicate part of the system, with the cone of the sub being exposed. Just make sure you handle the speaker around the edge when moving it around, and you won’t have a problem. The back of the subwoofer is where you connect the power, satellites and the computer or MP3 player. 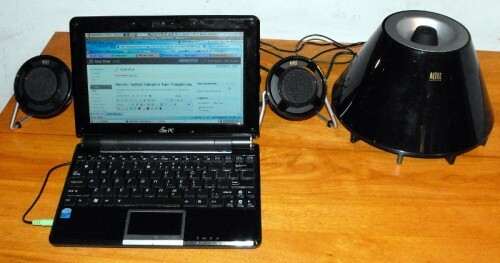 With an addition of a second double ended 3.5mm cable, you can attach your MP3 Player at the same time as your computer by using the aux port. This will keep you from having to crawl behind your desktop when you just want to listen to some music on your mp3 player. The right hand speaker has the only other set of controls on the system. These buttons are for changing the volume of the satellite speakers. It also has a light to indicate when the speakers have power. This is what the front of the speaker looks like. 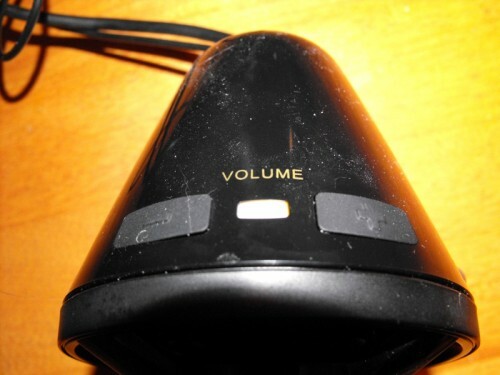 The left hand speaker looks about the same as the right, but does not have any controls on it. The expressionist PLUS system is very easy to setup and has excellent sound. It now has a permanent home in my kitchen providing my music and entertainment as I cook for my family. The Altec Lansing expressionist PLUS speaker system is available for $99.95 on the Altec Lansing site. You can also pre-order them on Amazon.com for the same $99.95. What I liked: Small, compact and sounds great. What needs improvement: Gloss black looks great in pictures, but in practice is a finger print and dust magnet. These will need a wipe down once a week, for sure!